A Year of Being Here: Kate Knapp Johnson: "Seeing, In Three Pieces"
"Seeing, In Three Pieces" by Kate Knapp Johnson, from Wind Somewhere, and Shade. © Miami University Press, 2001. In her notes the poet dedicates this poem to the life and work of Joseph Campbell. 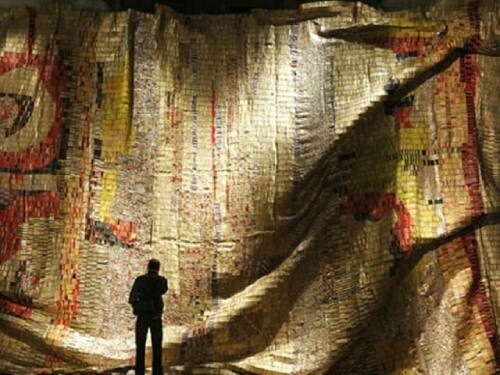 Art credit: "Fold Crumple," monumental sculpture of metal bottle tops by Ghanaian artist El Anatsui, photograph courtesy of the Museum of Fine Arts, Boston MA.